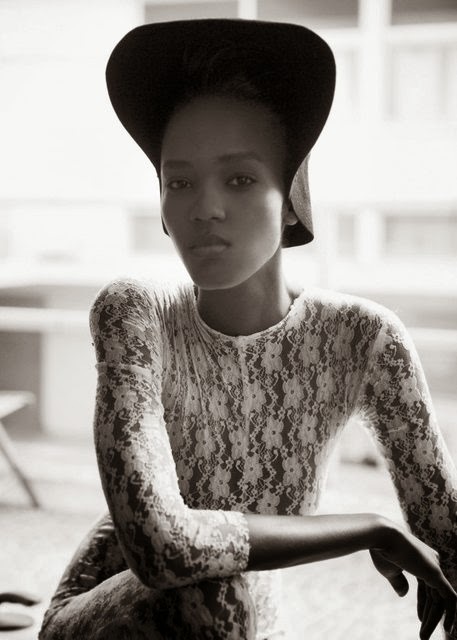 New York Model Management's Leila Ndabirabe was one of the most magnetic new faces that IMA encountered during castings for the Fall/Winter 2014 collections. 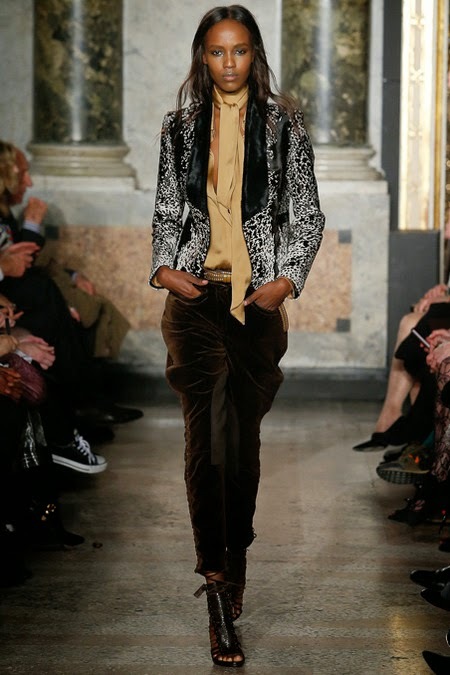 With her spectacular 180 cm frame, penetrating puppy dog brown eyes, and immaculate skin tone, it's unsurprising that Ndabirabe eclipsed the field during her rookie show season, displaying stunning versatility at Victoria Beckham, Oscar de la Renta, Marc Jacobs, Gucci, Bottega Veneta, Emilio Pucci, Chloé, and Hermés. Meeting Ndabirabe, it becomes evident that her personal backstory is every bit as fascinating as her striking physical appearance. Hailing from Burundi in South East Africa, Ndabirabe moved to Belgium at age ten with her mother to escape the country's devastating civil war. The statuesque Ndabirabe flourished in her new home environment, excelling academically while undertaking studies in Law at the Université Libre de Bruxelles before modelling intervened. 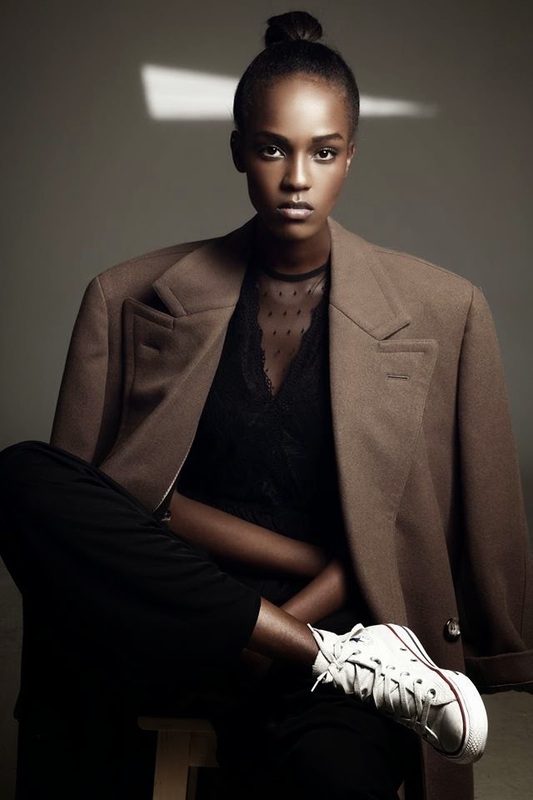 Cajoled by her family and friends who recognised her modelling potential, Ndabirabe approached her mother agency IMM Bruxelles and was signed on the spot. Modelling for just over a year, Ndabirabe's dual cultural background and experiences lend her an air of intrigue that is discernible in her exquisite poise, demeanour, and charismatic nature. On the runway, Ndabirabe marries the best of both of cultures combining a regal presence with a nonchalant cool and sophistication. Key support during the early stages of the Fall/Winter 2014 season from casting director Russell Marsh who cast her as a semi-exclusive at Victoria Beckham, precipitated a deluge of interest from designers and casting directors in Milan and Paris. Effortlessly chic at Hermés, girl-next-door for Tommy Hilfiger, free-spirited at Chloé, and super glamazon at Gucci, Ndabirabe enthralled all throughout her thirty-three pristine show bookings. Ndabirabe took time out post-Fashion Week to chat exclusively about her epic journey from her native Burundi to the runways of Europe, the invaluable life lessons that she has acquired through modelling, finding her place in the fashion industry, and the captivating meaning behind her name. 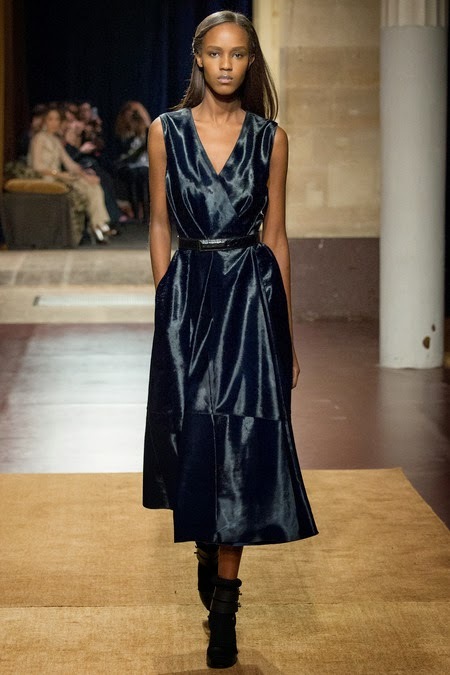 Inoubliable Model Army (IMA): Hi Leila, congratulations on a magnificent debut at the Fall/Winter 2014 collections and on making it onto IMA's Top 10 Newcomers list for the season! How are you feeling in the aftermath of Fashion Week and has the enormity of your achievements registered yet? Leila Ndabirabe (LN): Thank you IMA! After this crazy Fashion Week, I feel so grateful and blessed because I had the opportunity to walk for so many amazing brands and to meet different people who have all taught me more about the fashion industry. Now, I feel like I have lived twenty lives from New York to Milan and Paris. I have so many memories about those cities, the designers I met and new friendships formed. LN: Actually, I come from Burundi in East Africa. I grew up there and left when I was 10 years old. My mother decided to move to Belgium because of the civil war situation, therefore I had the chance to live this second part of my life. I started modelling one year ago and as I had always been the tallest and skinniest of my entourage, everyone was pushing me to model. I waited until I completed my studies then one day I went to see my mother agency IMM Bruxelles and they signed me directly. IMA: At the casting for Oscar de la Renta's Fall/Winter 2014 show, IMA was struck by your poise, grace and sophisticated beauty. Has modelling always been a dream of yours and were you surprised by the fashion industry's overwhelmingly positive response throughout your debut season? LN: I had always dreamed of being on the catwalk with the vibe created by the music and walking in high heels with other models but truly I had no idea what being a model included growing up. So it was like a dream come true this past season. I didn't expect to walk all those shows. It was a great surprise for me, I still can't believe it. IMA: You kicked off your Fall/Winter 2014 season as a semi-exclusive at Victoria Beckham before racking up a show tally of 33 pristine bookings including Marc Jacobs, Rodarte, Gucci, Versace, Bottega Veneta, Chloé, Dries Van Noten, and Hermés. 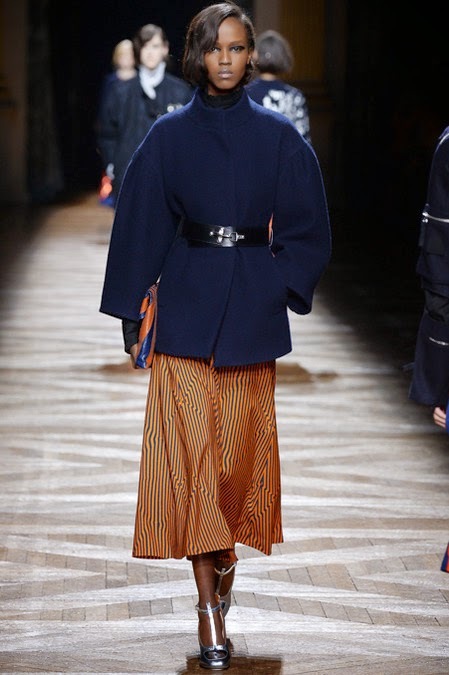 What are your most cherished Fall/Winter 2014 memories of the season both on and off the runway? LN: My first incredible memory of the season was of course, the Victoria Beckham show as it was my first big show. Which is also why I was so nervous and excited however when I was walking in the show I felt comfortable and wanted to relive the moment. My other special memory is from the Hermés show which was actually my last show. That was when I realised all the amazing shows I walked in and all the good experiences I just had. IMA: You were originally a law student at the Université Libre de Bruxelles before making a 'slight detour' into modelling! How does a law student end up in the crazy world of modelling, and have you found modelling to be as mentally stimulating in its own way? LN: As a law student who used to be always studying books, I can say that modelling is also stimulating in both a mental and physical way. Everyday, you are faced with new challenges, travelling to new cities without speaking the language, far from our families while learning so many different aspects about this profession all the while trying to find our own place in this world. So at the end of the day, you learn so many things about yourself and life which cannot be found in books. IMA: Success in modelling is contingent on having the right look, at the right time, and in the right place with the backing of a sound and professional management team. What do you appreciate most about NYMM's management philosophy and approach, and what advice did your agents offer in preparation for the Fall/Winter 2014 season? LN: The thing I really value about NYMM is the fact that they are careful, supportive, and concerned about each of us. I knew that I wasn't alone in this adventure because some days can honestly be really exhausting. The most important thing my agents told me is to always be myself and to have fun. IMA: What do you enjoy most about modelling and what are your long-term career aspirations? LN: I really enjoy wearing all of those beautiful creations and being able to somehow bring something of myself to the clothes. I hope I will have a long career with many enriching experiences, and to be a role model for little girls from Burundi who dream to be a model and think that it is impossible. 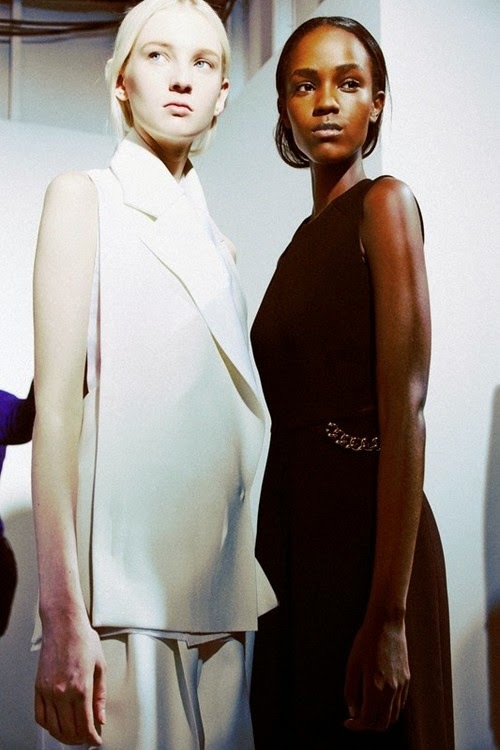 IMA: During the Spring/Summer 2014 season, ethnic diversity was embraced widely on fashion's runways with casting directors and designers featuring multi-ethnic line-ups in their shows. Do you feel that this casting 'trend' continued at the Fall/Winter 2014 collections? LN: This season we saw several ethnic model walking at the shows but I hope next season that there will be even more of a mix of girls. I still believe that things can change. Coloured girls also have their place in the fashion industry. IMA: Fashion Week is literally a United Nations Summit for modelling with girls converging from all over the world for one month of intense fashion madness. Did you have the opportunity to meet and bond with other models in between castings, round the clock fittings, and the shows? IMA: A model's sense of style plays an important role when meeting prospective clients and also in inspiring fashion trends for the public and within the industry. How would you describe your own street style? LN: I would say I am a mix between classic and casual style. I love to wear sneakers with a pair of jeans and a t-shirt. Also I love long coats layered with a nice dress underneath with high heels. IMA: Imagine you are hosting a dinner party and you could invite any five key industry figures to attend. Who would be on your guest list? LN: This is not an easy question because there are so many talented people I would like to meet and work with. Steven Meisel, Joe McKenna, Carine Roitfeld, Karl Lagerfeld, and Pat McGrath to name but a few! IMA: What do you miss most about your native Burundi and was moving to Europe an extreme culture shock? Do you envisage making the move to New york after having had a taste of the city this past season? LN: The thing I miss most about Burundi is the bright sunny days. It's summer the whole year round. To move to Europe was shock in the sense that I had to leave all my friends and family. In the end, I feel a complete mix of African and European culture which makes me who I am today. I'm also starting to feel at home now in NYC. IMA: Ndabirabe is an amazing name and one that IMA had no trouble pronouncing right on first attempt! Does it have a particular meaning in Burundian culture? LN: In my mother language, Ndabirabe means "to pay attention". LN: The thing that makes me "Inoubliable" is my humour. I love to laugh, smile, to tell jokes, and make people around me happier. go leila! i'm so happy that we finally have a burundian model in the industry and you're a great role model you made me want to go into modeling now. hoping that it will work, Make your country proud go leila! Great Job done by Leila. While she is not the first Burundian model (there was Esther Kamatari before her), she is starting very strong and in more prominent places (including New York). She also speaks more languages than most models, past and present. This may help her navigate the complex and globalised world of modeling. Keep up the good work!